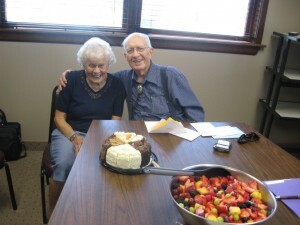 GraceConnect » Happy 86th Birthday, Charles Ashman! Happy 86th Birthday, Charles Ashman! The staffs of the Fellowship of Grace Brethren Churches and Brethren Missionary Herald Company combined with the Conference Advisory Team this afternoon to stage a party to celebrate the 86th birthday of Charles Ashman (right). Ashman serves as assistant to Fellowship Coordinator Tom Avey and still preaches each Sunday with a variety of preaching engagements. His wife Frances (left) joined the celebration this afternoon. Congratulations Charlie. You are an amazing man and I have appreciated you and your family for many years. Keep at it!